1. A harness. This collar-like device goes around your dog’s body instead of her neck. 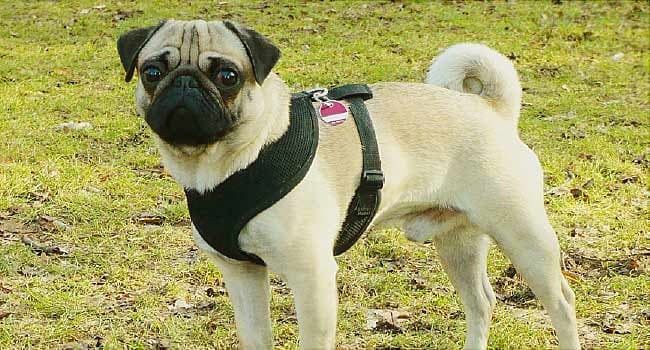 “Harnesses are the best option for long walks and hikes,” says Victoria Stilwell, a canine behavior expert for DOGTV. “If your dog tugs on the leash or tries to pick up the pace when you’re not ready, a harness gives you good control without putting excess pressure on her neck.” Tip: Test out new products at home first. 2. Foldable water bowls and water. “If you’re thirsty, chances are, your dog is, too,” says Christy Hoffman, PhD, an assistant professor of animal behavior at Canisius College in Buffalo, NY. Your pal can get dehydrated fast -- especially when he's active. So, stash a collapsible water bowl in your backpack or in your pooch’s pack. Bring extra water if you aren’t sure you’ll have access to a clean source. Travel bowls can pick up bacteria and other outdoor bugs, so wash yours with soap and water after every use. 3. Insect repellent. Dogs’ thick fur often keeps bugs at bay. Even so, flies, mosquitoes, ticks, and other insects can prey on your pooch. Their bites don’t just irritate -- they can cause illness. “Using a spray repellent, salve, or ointment makes long walks or hikes a lot more comfortable for your dog, especially during buggy seasons like summer,” says Jeff Werber, DVM, a veterinarian in Los Angeles. Check with your vet to see what’s best for your pet. 4. A first-aid kit. Injuries happen, so you’ll want to carry one of these with you, especially if you’re headed more than a mile or so from your car, or if your hound is too heavy for you to carry. Pet supply stores often sell prepackaged emergency kits made for dogs. Or you can bring the one you’d carry for yourself -- most human medical supplies, like gauze pads, adhesive tape, antibiotic ointment, and tweezers, are the same ones you need for your dog. If you’re planning a long trip or your pooch has a health condition like diabetes, ask your vet about specific supplies to include. 5. A snack pack. A bite to eat can tide your pal over during long treks. But there’s another reason to bring a bag of yummy-smelling goodies: “If your dog gets free of her leash or harness for some reason, you can use treats to lure her back, and to reward her for coming when you call,” Hoffman says. 6. A frozen bandana or cooling vest. Soak a bandana in water, then freeze it for at least an hour or so. Tie the fabric loosely around your dog’s neck before you head outdoors. “It’s one of the easiest ways to help your dog feel a little cooler if it’s going to be 80 degrees or higher,” Werber says. Try a cooling vest if your pup tends to overheat or if she’ll be active in warm weather for more than half an hour. Worn around the torso, it lowers body temperature with ice packs or by releasing moisture and air. 8. Sunscreen. Canine skin can burn just like humans’. Pets can get skin cancer, too. To protect your dog, keep her out of the sun between 11 a.m. and 3 p.m., when rays are most intense. When she’s exposed -- especially during the late spring, summer, and early fall -- apply a sunscreen made for dogs that’s SPF 30 or higher. (Don’t use sunscreen for humans -- some ingredients can be toxic for your pooch.) Put sunscreen on her nose, ears, and other areas of exposed skin. If she has short hair, you’ll want to put sunscreen on her body, too. 9. Saddlebags or doggie “backpacks.” A bag that hangs over your dog’s back can help her carry some of the load when you’re on the road. But don’t fill it up before you call your vet. “Age and health history make a big difference in how much weight a dog can carry,” Hoffman says. Ask your vet which product is best for your buddy -- don’t go by what the package suggests. Like people, pooches need to build up endurance over time. If your dog hasn’t been active lately, pack light and go slow. Victoria Stilwell, dog trainer, canine behavior expert, DOGTV. Christy Hoffman, PhD, assistant professor of animal behavior, Canisius College, Buffalo, NY.